We returned from Windsor last week and are happy to report seeing a bird that is a rarity on the prairies, the Northern Cardinal. 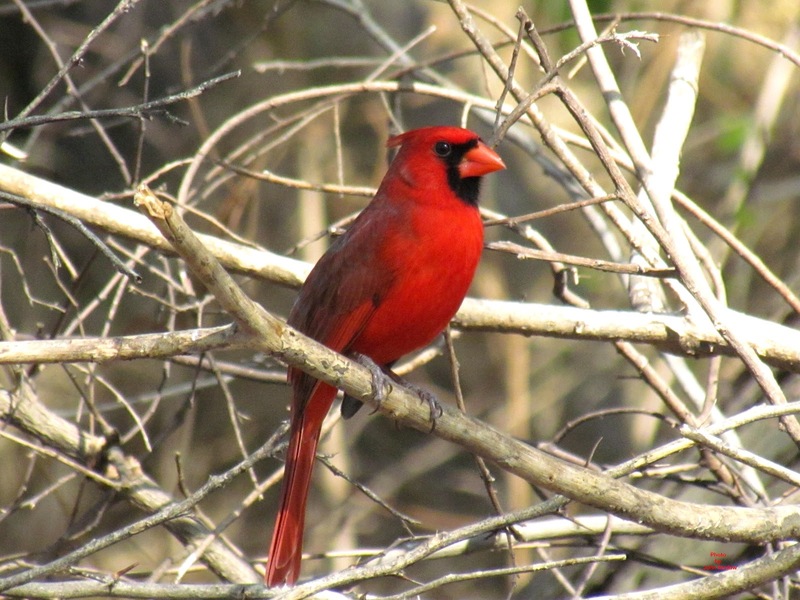 The Cardinal is one of three spectacular red coloured birds found in southern Ontario. The other two are the Red Headed Woodpecker and the Scarlet Tanager and seeing any one of the three is memorable. 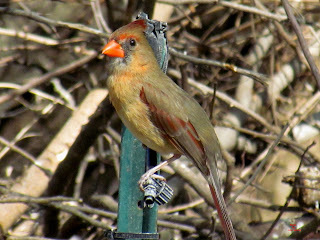 The Cardinal that we saw was the grey female that visited our daughter's yard on several occasions. Unfortunately, the Cardinal, never hung around long enough for me to get a photo of her. Cardinals are related to both sparrows and finches and behave as such. They stay close to the ground usually well hidden in shrubbery and thickets feeding on seeds that may be found there. As with most sparrows and finches Cardinals readily come to feeders. Of all members of the family the Cardinals are the most vividly coloured. The crested all red male with a black face and pink bill is striking and cannot be mistaken for any other bird. The female is a grey-brown with traces of red especially on the crest. Both have pink bills. 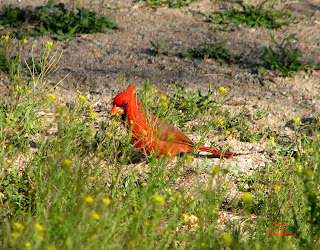 Cardinals are non-migratory and so are very rarely seen on the prairies where winters are too extreme. This week's topic is rather timely in that the fall issue of the Yellowhead Flyway Trail Birding Association (YFTBA) has an article about Cardinals being heard and seen in the Yorkton area this past summer. To confidently expect to see a Cardinal a person has to travel to the Carolinian Forest region of southern Ontario. The area in question has its northern limits around Toronto extending south to the Carolinas. Although the Cardinal's range in Canada is limited, in the USA it is found all along the eastern seaboard westward through the south central and western desert states. In the desert and semi-desert areas of the US and northern Mexico the Pyrrhuloxia (in Greek Firehead) coexists with the Cardinal and often causes confusion in identification for novice birders. 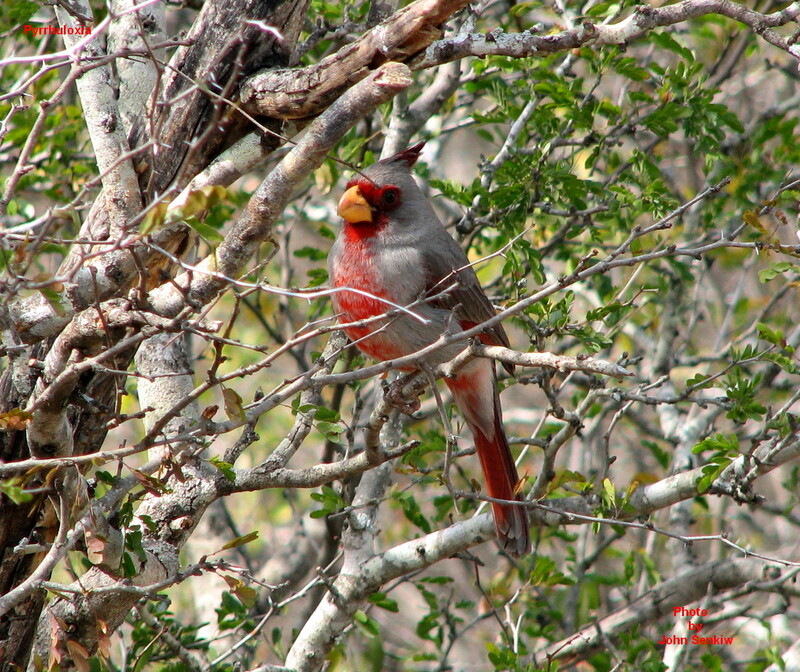 The male Pyrrhuloxia and the female Cardinal look much the same except for the colour of the bill. The Northern Cardinal has a orange/pink bill; the Pyrrhuloxia, often referred to as the Desert Cardinal, has a yellow one. There are other more subtle differences also but the bill colour is the best field mark. Although brightly coloured Cardinals are really quite hard to spot as they rummage around in dense bushes, however, their frequent and rather harshly uttered "pink" gives them away. Then, sooner or later, they come into view and the wait is worth the while. 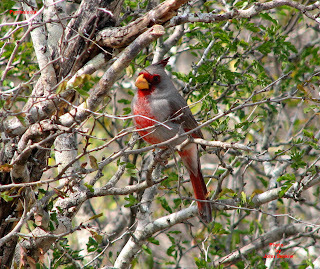 The picture of a male Pyrrhuloxia was taken in February , 2006 in southern Texas. 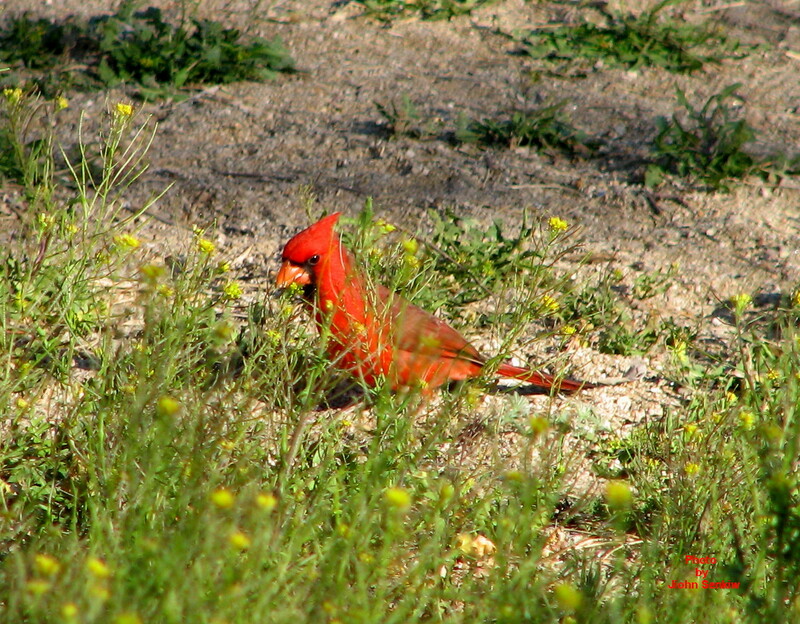 This week's picture of a Cardinal was taken in March in southern Arizona a few years back. The male (hard to tell in black and white) was actually gathering grasses for nest building. The surprising thing is that he was very confiding and let us get up very close for some good photos. Most Cardinals are quite skittish and do not like to get too close physically to humans. The photos of the perched male and female cardinals were also taken in Arizona but on a different field trip. It is too bad that they are not here in Saskatchewan to provide a little more colour to the mostly whites and greys of winter.